We have a HUGE flatbed equipment trailer inventory! From 10K 18' long equipment flatbeds to 20K 22' long equipment flatbed trailers, whatever equipment you haul, we have a trailer to fit it! Shop the lowest prices on PJ equipment trailers, Load Trail equipment trailers, and Diamond C equipment trailers. 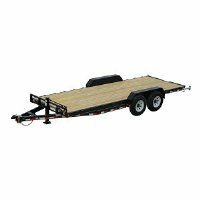 Steel floors, standup ramps, slidein ramps, toolboxes, and gooseneck equipment trailers are just a few of the options we have to choose from!